Proxy Checker tool is integrated into Proxifier, but it can be useful on its own. It allows you to test proxy servers and check whether they can work with Proxifier or not. Test SOCKS v4(A), SOCKS v5, HTTPS and HTTP proxy servers. Get an easy-to-understand report with recommendations that can help to solve a problem (if any). Measure proxy server response time (latency). 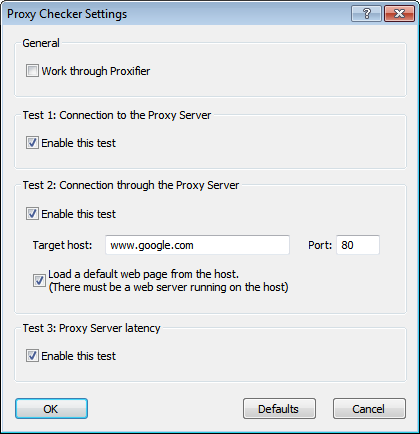 To check a proxy with Proxy Checker, click the Check button in Proxy Settings dialog. Alternatively you can run Proxy Checker manually in Proxifier with the toolbar button, View->Proxy Checker... or Start->Programs->Proxifier->Proxy Checker (Windows Start menu) and specify proxy details with the Proxy Server... button. Use the Start Testing button to begin the test. To adjust Proxy Checker settings click the Test Settings... button. Work through Proxifier — Proxy Checker will bypass Proxifier when this option is disabled. This is the default value and it should only be changed in a very special scenario (e.g. the target proxy is not directly accessible). Target host and Port — set the target host for the test connection. Load a default web page from the host — enable to test data transfer. You can enable/disable particular tests. You may use and distribute Proxy Checker as a standalone application (ProxyChecker.exe). Proxy Checker is free for personal and noncommercial use.